On October 7, 2017, there was no in-state rivalry between the University of Nevada and UNLV. 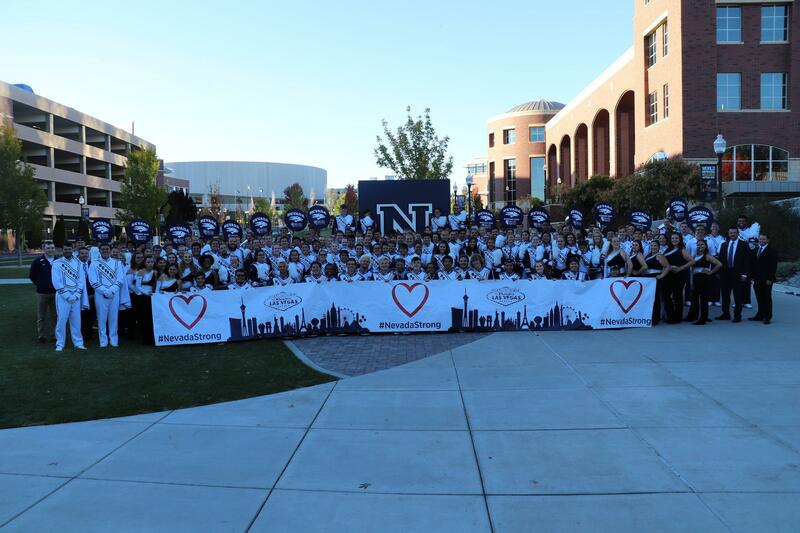 The University of Nevada Wolf Pack Marching Band centered its halftime performance around honoring family, friends, and all of those affected by the tragedy at the Route 91 Harvest Festival in Las Vegas. The Wolf Pack Marching Band opened the performance with two selections from its show, 'How the West was Fun.' First, the group performed the "Theme from Rawhide" before welcoming members of the Wolf Pack Spirit Program to collaborate in an encore performance of Big & Rich's hit, "Save a Horse (Ride a Cowboy)." The Wolf Pack Marching Band next performed the official song of the State of Nevada, "Home Means Nevada." This selection was accompanied by drill that organized members in a formation that resembled the shape of the State of Nevada, after which a heart was placed over Las Vegas and a banner was unveiled that showed the Las Vegas skyline and the text, #NEVADASTRONG. The halftime show ended with members of the Wolf Pack Marching Band forming concert arcs, removing their shakos, and offering a performance of Carmen Dragon's setting of "America the Beautiful" to remind the crowd that we are ONE COMMUNITY. ONE PACK. Without being prompted, the football crowd stood during this last selection, only braking its silence to offer supportive cheers in the final measures of the piece. Although Las Vegas is over 450 miles from the University of Nevada, the tragic events at the Mandalay Bay felt closer. Much closer. Roughly one-third of the student body at the University of Nevada comes from the greater Las Vegas metro area. The Leadership Team for the Wolf Pack Marching Band is listed at the end of the video. Arrangements were created by Steve Martin and Blair Williams. The voice of the Wolf Pack Marching Band is Dan Marran.